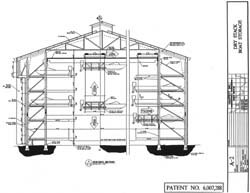 The design of a dry stack system is essential to creating an efficient operation. We design our rack systems in accordance with AISC (American Institute of Steel Construction) specifications and local building codes. All of our rack components are manufactured from hot-rolled structural steel and all fasteners are high strength galvanized bolts and nuts. 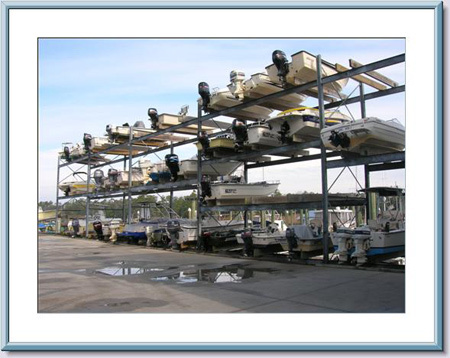 There are three basic criteria to consider in the design of any boat storage system - Unit, Area, and Method. Unit - This refers to the boats to be stored. The size factors of boat weight, length, width, and height (profile) form the basis for ensuring sufficient capacity and clearances. Soil conditions - can affect the building, bulkhead and launch areas. Method - This relates to the type of handling equipment to be used in the system. There are two standard methods of handling boats in a dry stack operation - the marina forklift and cranes. Marina forklifts are the most predominant and versatile handling equipment in dry stack operations. www.ibeglobal.com These forklifts are heavy duty machines with extended forks and special masts. They are generally capable of lifting boats to three, four, and five levels high, while also being able to launch or retrieve boats by lowering the mast below the bulkhead (negative lift). The features which directly affect proper design of the dry stack are the lifting capacity, turning radius, overall mast height at full extension, and mast height when traveling. Stacker cranes have become a viable, although expensive, alternative to forklifts in dry stack facilities. They offer some advantages to those customers willing to pay the heavy price tag. A crane is capable of higher density storage, up to nine or ten levels high. The crane's lifting capacity does not decrease at the upper elevations. Crane offers good visibility as the operator in the cab of the crane is at the same level as the boat being handled. It is electrically powered eliminating diesel fumes and noise. The cab and forks can rotate 360 degrees. Lastly, the crane does not require as wide an aisle to handle boats, thereby saving valuable space. A revolutionary new concept in dry stack storage is the Maff-Stack system. www.maffetts.com The Maffett System utilizes an overhead bridge crane and cradle assembly to lift the boat from the water and transport it to the storage facility. This system is highly adaptable, is cost competitive, and addresses the problem of vertical limitation restrictions. This new concept requires 20% less building space or "building footprint".